Senior nursing students take part in a half-day poverty simulation designed to illustrate the systemic, social determinants of health. 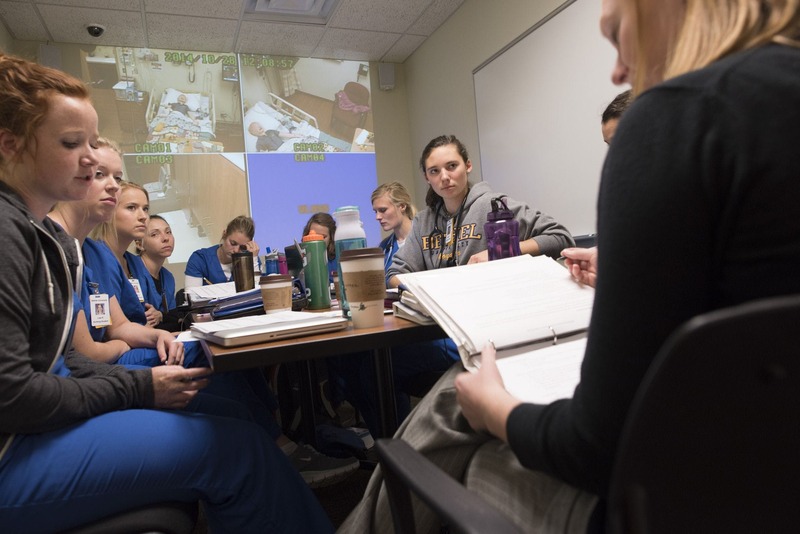 A typical day in Bethel’s nursing program might include hands-on work in a simulated hospital room, skills tests, or perfecting one’s vaccination technique. But one day during senior year, the situation is quite different. During an extensive poverty simulation in the required public health nursing course, students might find themselves stuck in jail or prioritizing whether to buy baby formula or insulin. 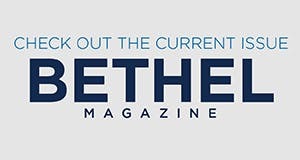 Using a curriculum adapted from a local church, faculty assign students community or family roles at random and—depending on the crises and situations they’re dealt—they must navigate a complex web of resources to make ends meet. Just like in real life, delays and closures happen that impede progress. Their only car may break down or be broken into. Purchases and time commitments must be prioritized, and some responsibilities inevitably suffer. The three-hour exercise is a condensed simulation of what a month living in poverty might be like for a retired couple with health issues living on a fixed income, a family with several children and live-in grandparents, or a single mom caring for her children. “The goals are threefold: to assist students to better understand the experiences of those living in poverty, to recognize the complexities of poverty, and to identify and better understand the social determinants of health,” says Professor of Nursing Carol Hargate. In other words, the exercise and subsequent debrief conversation allow students to reflect on the social and systemic aspects of healthcare—the things that are beyond one’s control but might impede good nutrition, regular checkups, or the ability to carry out doctors’ recommendations. The simulation is not a stand-alone experience, but part of a constant thread of exposure to social agencies and complex public health issues. Spring semester of sophomore year, nursing students begin regular work with community engagement sites and interprofessional care teams. Throughout the program, students gain a firsthand understanding of actual patient situations and the barriers that impede health equity. Brooke Ellingson ’16, GS’19 works at the Mother Baby Center at United Hospital in St. Paul, and she’s pursuing her M.S. in Nurse-Midwifery at Bethel. She remembers the poverty simulation frequently in her work supporting families who come from a variety of contexts. It helps her consider the barriers—financial, cultural, transportation-, or language-related—that might come into play for a family seeking care. During her simulation at Bethel, Ellingson was assigned a large family that quickly maxed out food bank allotments. A member of the family was given an option to sell an item illegally in return for cash, and he took it. In her career, Ellingson is familiar with the plethora of social agencies and resources available, but also with the number of factors that must line up in order for a family to take advantage of them. Explore Bethel’s Bachelor of Science in Nursing and adult and graduate nursing programs.